2013 Flow Mach-2 4020b mdl. M2 4020B CNC Waterjet Contour Machine w/ Flow Pedestal Controls,mdl. 014659-1 30Hp 60,000 PSI Intensifier s/n 1113-14501, 84” x 170” Table, Flow Garnet Hopper,Ingersoll Rand Refrigerated Air Dryer. MultiCam 2-Head CNC Plasma Cutting Machine s/n 3305 P7028 w/ MultiCam Pendant Controls,Hypertherm PowerMax 1000 Plasma Power Source, Hypertherm HyPerformance Plasma Gas Console, HyPerformance Plasma HPR260 Cooling Unit, 83” x 145” Table, MicroAir Clean Air Systems 8-Element Dust Collector. 2002 Accurshear 625012 ¼” Cap x 12’ CNC Hydraulic Power Shear s/n 4451 w/ Accurshear CNC BackGauging Controls, 144” Squaring Arm. 2006 RAS TURBObend plus mdl. 62.30 10’ CNC Folding Brake s/n 59/1 w/ Touch & More System 6000 CNC Controls, 125.98” x 0.079” Thk Cap. 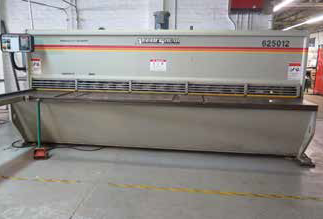 Chicago Size 510-D ¼” x 10’ Press Brake s/n P-8067 w/ 12’ Bed Length, 8” Throat, 121” Between Uprights. DiAcro mdl. 14-48-2 14GA x 48” Hydrapower Press Brake s/n 6821180747 w/ Manual Back Gage, 48”Bed Length, 6 3/8” Throat, 36” Between Uprights. Piranha P50 50 Ton Hydraulic Ironworker s/n P5010692 w/ 50 Ton Punch Cap 1 1/16” thru ½”, 13/16” thru ¾” Cap, Shear 1” x 4” Flat Bar, ¾” x 10”, 5/8” x 15” Cap, 5” x 5” x 3/8” Angle Shear Cap, Coping Notcher 2 ¾” x 4” x ¼” Cap. 2006 CML / Ercolina Type CE70 Roll Former s/n 7006035 w/ Ercolina Controls, 2 ¾” Shaft Dia., Dies to 3 ½”. 2003 CML / Ercolina Type CE50MR3 Roll Former s/n 1030088 w/ Ercolina Controls. 2004 CML / Ercolina Type 030.TRIF Hydraulic Tube Bender s/n 3040303 w/ TB-100 Controls, 2 ½” Cap Dies. 2006 CML / Ercolina Type TUP-030 Hydraulic Tube Bender s/n 3006084 w/ Ercolina TB-100 Controls. 2005 CML / Ercolina Type EN180 Coping Sander s/n 1805009 w/ 7” Belt Cap, Manual Clamping, Compound Coping Angle Adjustment. 2004 CML / Ercolina Type EN100 Coping Sander s/n 1004046 w/ 5&quot; Belt Cap, Manual Clamping, Compound Coping Angle Adjustment. Roper Whiney Pexto mdl. 418E 16GA x 48” Hand Roll s/n 387-3-84 w/ 3” Rolls. 2016 Kaeser BSD50 Sigma 50Hp Rotary Air Compressor s/n 1614 w/ Kaeser Sigma Control 2 Digital Controls, 236 CFM @ 125 PSIG, 4239 Run Hours, 1608 Load Hours. 2016 Kaeser BSD50 Sigma 50Hp Rotary Air Compressor s/n 1620 w/ Kaeser Sigma Control 2 Digital Controls, 236 CFM @ 125 PSIG, 3247 Run Hours, 984 Load Hours. Ingersoll Rand SSR-EP50 50Hp Rotary Air Compressor s/n D6006U88C w/ 205 CFM @ 125 PSIG. 2016 Kaeser TF171E Refrigerated Air Dryer s/n 1000003128155 and KCF100 Oil-Water Separator. 2016 Kaeser Vertical Air Storage Tank. Hyd-Mech S-23A 16” Automatic Hydraulic Horizontal Band Saw s/n XA0305320FD w/ E100 Digital Controls, Hydraulic Clamping and Feeds, Conveyor, Coolant. Startrite 30RWF 30” Vertical Band Saw s/n 106730 w/Blade Welder, 19-360 Dial FPM, 21” x 21” Table. Hitachi and DeWalt Miter Saws. Powermatic Pedestal Drill Press w/ 24”x 80” Table. (2)Rigid and Frejoth Pedestal Drill Presses. Burr King mdl. 760 1 ½” Pedestal Belt Sander. Rockwell 12” Disc Sander w/ Stand. 2006 Clenco Sand Blasting Pot and Gun. Nordson “Vantage” Powder Paint Spraying System. MPC Matthews Paint Color Mixing System. Large Quantity of Cardinal, Tiger and IFS Powder Paints. Miller Phoenix 456 CV/CV DC Inverter Arc Welder s/n LB033659 w/ Miller HF-251 D-1 High Frequency Arc Starter, Miller PC-300 GTAW Pulse Control, Miller Coolmate-3 Cooler. Miller Deltaweld 451 CV-DC Arc Welding Power Source s/n KC218789 w/ Miller D-60 Dual Wire Feeder. Miller 330ST Aircrafter CC-AC/DC Arc Welding Power Source s/n JH194042. Miller Syncrowave 250DX CC-AC/DC Squarewave Power Source s/n LC679672. Miller Syncrowave 250 CC-AC/DC Arc Welding Power Source s/n LA171897 w/ Cooler Cart. Miller Millermatic 252 Wire Welder s/n LJ450028B. (4) Miller Millermatic 251 Wire Welders s/n’s LH120902B, LH050683B, LG171655B, LC287792. (2)Lincoln PowerMIG 215 MIG Welders s/n’s U1080104679,U1070500991. (5) OTC MIG135 MIG Welding Power Sources s/n’s P7973YD7972001, P7973YDK179861003, P7973YD7816003, P7973TD7972001, DK13617106. Miller Bobcat 250 CC/CV-AC/DC Welder – 10,000 Watt Gas Powered Generator w/ Electric Start. Miller Bobcat 250 CC/CV-DC Welding Generator s/n LJ140266H w/ Gas Powered Engine. Hypertherm PowerMax 1000 Plasma Power Source. (2) 52” x 192” Rolling Assembly Tables. 4’ x 12’ and 4’ x 10’ Welding Tables. 2000 Ford F-650 Stake Bed Truck Lisc# 8Z77642 VIN# 3FENF6517YMA01252. 2007 Ford F-350 XL Super Duty 8’ Utility Bed Truck Lisc# 8F37949 w/ 5.4L 3V Triton Gas Engine, Automatic Trans, AC, 114,413 Miles, VIN# 1FDWF34517EA56439. 2004 Ford F-250 Pickup Truck Lisc# 7P54065 w/ Gas Engine, Automatic Trans, VIN# 1FTNX20L34ED70276. 1997 International Crane Truck Lisc# 8F76466 w/ Elliot Hydraulic Boom Crane VIN# 1HTSCAAM2VH495188. Ford Diesel Hydraulic Crane Truck (Yard Vehicle) w/ Diesel Engine, Eaton Fuller Trams, Chelsea PTO, Hydraulic Rear Outriggers, Manual Front Outriggers, 74,447 Miles, VIN# 1FDYY90W3GVA46953. Caterpillar PG30 6000 Lb Cap LPG Forklift s/n 7AM00995 w/ 3-Stage Mast, Side Shift, Solid Yard Tires. Caterpillar GP25 5000 Lb Cap LPG Forklift s/n 5AM06166 w/ 3-Stage Mast, Side Shift, Solid Yard Tires. 28’ Gooseneck Trailer Lisc 4HU2341 VIN# 1B9GF48298G663913. Extrusion, Stainless Steel and Steel Square and Round Tube Stock, Angle Iron and Bar Stock, Aluminum and Stainless Sheet Stock. Cantilever Sheet and Bar Stock Racks. Hardware, Electrical Wire and Acces, Brackets, Mounting Hardware and Acces.